The season of grief – Mother’s Day and beyond. 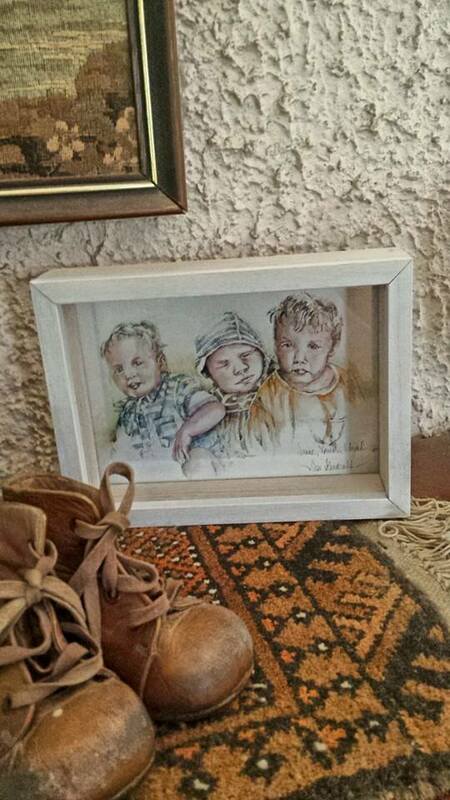 My beautiful Dad created this image of all three of my boys. My annual season of grief has begun. It starts with the memories of two little boys whom I never met, but hold dear. March & April saw their respective anniversaries. I remember those two little boys always. But on the days belonging to them, I spent some time thinking about them and their dear mothers. Since I lost Xavier, ANZAC day has gained a different kind of meaning. I remember the first ANZAC day after I lost Xavier. For the first time in my life, I did not think of the diggers and their sacrifices during the minute silence. I thought instead of their mothers, their children and the memories that would never be made. I thought about grandchildren who would never been born and worlds shattered that had to continue turning. I have no experience of a battle field. I don’t know what horrors lie there. I don’t pretend my grief is the same as the mother who loses her adult son to the bloody futility of war, but I know a little of that pain. I know how life cracks when a parent buries their child. May holds Mother’s Day and duality of emotions. Elation that I get to celebrate my two boys on earth and an aching sadness for the one not here. Doubt as I receive presents heralding me as “World’s Best Mum”. For clearly, I am not. The World’s Best Mum would have saved her child. The happiest days can be the hardest. Pressure to be jovial for the children in your arms and pressure to grieve harder for the one not there. Always trying to make space for all three of them, and not always succeeding – they live on such different planes. Mother’s Day will see a six year old attempt breakfast, a nearly two year old smother me in kisses and a nearly three year old visited at a gravesite. Joy and hope and love and sadness all intermingled with an intensified poignancy that only occurs on certain days during the year. June will see Xavier’s birthday and July will see his anniversary. Three years. How can that be? My tiny little baby, three years old. Three year olds are joy personified. They are full of verve and life. They are the antithesis of sadness. Three seems to have very little to do with my Xavier. My forever newborn son. In Australia, Mother’s Day is the second Sunday of May. It can be one of the hardest days in the year for a bereaved mother. If it’s important to you that your partner get you something on behalf of your child, let them know. I know you don’t want to have to do that, but it’s better than seething all day if it doesn’t happen. They may not realise how very important it is to you. Let another bereaved mother know that you are thinking of them. Carly Marie does a range of beautiful cards specifically for bereaved mothers. Set aside some time to spend with your child. Let your loved ones know that you need that time. Be prepared for the day to be hard. I am always surprised by how difficult Mother’s Day is. Step away from social media if seeing pictures of perfect families is all too much. You don’t have to torture yourself. Be gentle with yourself this Mother’s Day.